Look, I agree, the page title isn't too exciting. History is such a dull word. In our case though, Scottish history is well worth discovering. We've got lots of castles, battlesites, historically-themed visitor attractions. So here's some background and a few, hmm, highlights. It's all you need to know for bluffing your way round any museum in Scotland. Further down the page are a series of snapshots of the goings-on at certain points in Scotland's story. Let's pick it up here when that story starts emerge from the Dark Ages. Because until, say, the 12th century, Scottish history includes a whole lot of shadowy battles between the peoples who represent the building-blocks of Scotland: mostly Picts, Scots, Britons, Angles and Vikings. Few early kings died peacefully at home. Scotland wasn't the shape it is today. As for the border, well, the territory of the Picts and Scots was really only north of the River Forth, but hemmed in by the Vikings further north still. They held sway over today’s Caithness and Sutherland from a power-base in Orkney. The Lothians, around and east of today’s Edinburgh, were held by the Angles until 1018, while the kingdom of the Britons in Strathclyde became part of the land of the Scots even later. It wasn’t until after 1263, when the Vikings were finally defeated at the Battle of Largs, that the nation of Scotland began to take the shape that we know today. From the very earliest dates in Scottish history, the Scottish kings were keeping an eye on that other more powerful kingdom in the south – England – an inescapable factor in Scotland and its history. Around the same time in the 13th century, I suspect, this dreadful old joke was coined….. Shock: Scottish monarchs marry spouses from the south. Local lasses not good enough, eh? Scottish history reveals that ever after, the Scottish monarchy, both the Royal House of Canmore, and the later Royal House of Stewart, would often diplomatically marry into English royalty and complicate matters of nationhood greatly – starting with King Malcolm III (Canmore or ceann-mor – ‘great head or chief). He married Margaret, daughter of the English King Edward the Confessor. The king liked what he saw, especially the bit about governing the outlying bits of his kingdom through tame nobility who were able to raise a bit of revenue – this often kept them quiet and on-side. So David, as King of Scotland, found himself a posh Anglo-Norman heiress to give him an English title (the Earl of Huntingdon) by this marriage. Then he proclaimed open house north of the Border for any Norman nobles who wanted a slice of Scotland. This is why (most famously) Bruce, but also Grant, Fraser, Barclay, Sinclair and lots more common Scottish surnames have Norman-French origins. (Pictured here) The Tolbooth at Forres in Moray. Though this tolbooth is much later than the actual burgh charter signing – sometime between 1130 and 1153 – it stands in the centre of the town as a symbol of the administrative HQ of the old burgh. You’ll see the word on town names even today. ‘The Royal Burgh of…. etc’. A royal burgh had certain privileges granted by the king. The notion of a burgh played an important part in Scotland history. A burgh could protect itself by walls and gates. It could elect officials to make local laws. Most importantly, it could trade – make money through its markets and manufacturing, for which duties and taxes would be paid to the royal coffers. Armies might come and go, political parties and factions would leave their mark, but in the history of Scotland, the burgh system, as the bedrock of day-to-day economic life, thrived for centuries. And though not all burghs survived, many prospered – which is why towns and cities, from Aberdeen to Dumfries, can trace their origins back to the granting of charters in the 12th century. (Pictured here) The skyline of the old Town House in Kirriemuir in Angus. Dating back to 1604, it now houses the local museum, telling the story of the burgh. So, that's all you need to remember about Scottish history first of all. Sure, it was bloody at times, but ordinary folk had to get on with their lives. What? The history of Scotland on a single page? Am I mad? Let’s do it by snapshots from the Stone Age to the Highland Clearances. Plus a wee mention of Bonnie Prince Charlie. Wish he’d just stayed away. I know, I know. I said further up that Scottish history starts around the time of the early burghs. Really, this bit is prehistory. And if you are going to see the best of prehistory in Scotland, then Orkney is a convenient location, as nowhere else in Scotland delivers that sense of the unknowably ancient. So, for that sense of really ancient days that head for Skara Brae in Orkney. Or at the Standing Stones of Stenness, or the Ring of Brogar or Maes Howe. For anyone who is interested in connecting with the ancestors of the ancestors, these are the places to go, in all of Scotland. (Pictured here) Early spring at the Ring of Brodgar, in Orkney’s Neolithic heartland. (Pictured here) Standing Stones of Stenness, Orkney. What went on here? No idea. People stand around and puzzle. Island of Hoy on horizon. Then, staying in Orkney (because I like the place), fast forward to the Vikings. (SNAPSHOT 1) The climate has gone off - big-time - and it’s a miserable day, so a bunch of them, looking for treasure, have found their way into a chambered tomb. While waiting for the weather to clear, they scratch a variety of graffiti into the stonework. You can still see the runic (and rude) things they wrote on the walls, as the tomb at Maes Howe is now a surviving example of one of the very finest examples of Neolithic craftsmanship to be seen anywhere. The point is that you may consider the Vikings to have lived a long time ago. But on a time-line of the history of Scotland, these 12th-century guys were making marks inside a structure that was already 4000 years old! St Magnus Cathedral (pictured here) is in the centre of Kirkwall – it is also known as the ‘Light in the North’ It was founded in 1137 by the Viking, Earl Rognvald, in honour of his uncle St Magnus. Much of the medieval stonework is thought to have been done by master masons trained at Durham Cathedral in England. It is the most northerly cathedral in Britain and contains many interesting memorials to famous Orcadians such as Eric Linklater, George Mackay Brown and the explorer John Rae. It is a fascinating place to visit. By the way, the National Trust for Scotland opened a visitor centre on the site of the 1314 Battle of Bannockburn, in time for its 700th anniversary. There’s some background to Bannockburn here, though it mostly deals with Robert the Bruce’s PR team. (I wouldn’t take it over-seriously, if I were you.) All of these topics are important in the history of Scotland and we can return to them some time. – oh no, what’s he doing in Glasgow? Bonnie Prince Charlie 'The Young Pretender' from the old Stuart line, his family in exile, has been brought up to believe that with the help of the Catholic nations of Europe, such as France and Italy, he can regain the throne. There is sympathy for this cause in both Scotland and England. As it was King James (Charles's grandfather) who went into exile, supporters of the Stuart dynasty are called Jacobites, from the Latin Jacobus, meaning James. Charles landed in Scotland in the spring of 1745 and caused quite a stir and won a few battles against the government armies in the now united kingdoms of Scotland and England. So let’s focus on the winter of 1745. Let’s go to Glasgow. There are cargoes unloading at the quayside on the River Clyde – tobacco, sugar and rum come in. Linens, woollens, shoes, stockings and metalware go aboard. It’s all heading for the Americas and Glasgow’s merchant class is making its fortune. (SNAPSHOT 2) Suddenly in the middle of all this mercantile bustle, there’s the sound of bagpipes and a crowd of unkempt and wild Highlanders march in and draw up on the ground beside the river. Oh, great - it’s the last thing the locals need. Who are these people? Well, it's a Highland army - but under control as this is Bonnie Prince Charlie’s forces, northbound. Having failed to get to London, England, and now heading for disaster, they’re looking to re-equip. The Glasgow townsfolk are aghast. Charles demands 12,000 shirts, 6,000 coats and 6,000 pairs of stockings for his ragged army from the ‘Merchant City’ – the heart of this industrial city. While all this is being organised, the Young Pretender goes out to dinner, and reviews his troops on Glasgow Green. The busy folk breathe a sigh of relief as the mob eventually leaves for the north. Glasgow’s mercantile outlook was an important part of the history of Scotland. Only a little later after Charlie’s departure, they started to make even bigger, heavier things and exported them across the world. That’s a detail (pictured here) of a steam loco in Glasgow’s fine Transport Museum, Riverside Museum. So, off goes Charlie to defeat and Jacobite romantic myth-making - and Glasgow gets on with the Industrial Revolution, making money and playing its part in building a forward-looking economy. The mad adventure by the reckless and deluded prince ends in slaughter on the battlefield of Culloden a few months later. 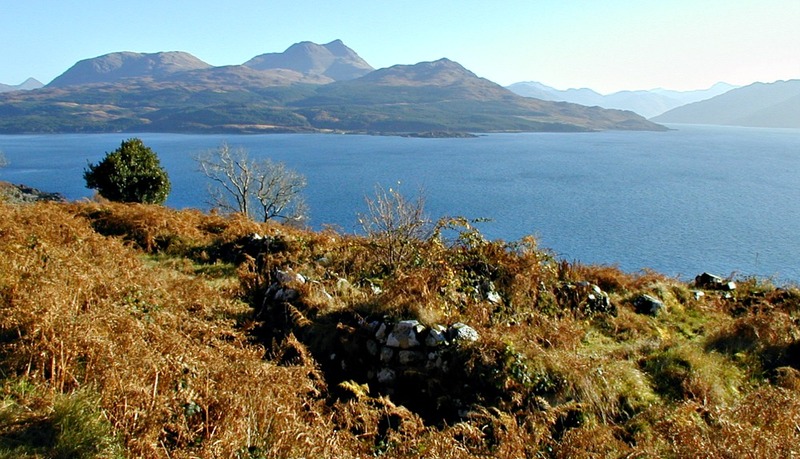 (Pictured here) A barely recognisable abandoned village on the island of Skye: Leitir Fura, near Kinloch. A sad chapter in the history of Scotland. The inhabitants went to Canada. This is looking eastwards to the mainland, Ben Sgriol on the horizon. Ethnic cleansing or just toffs and monied industrialists tidying things up? Finally, let’s go forward another hundred years from Culloden. (SNAPSHOT 3) There’s a gathering in a kirkyard, actually, Croick Church, high up a remote Highland glen (but an easy drive, say, from Inverness). The people are straggling in, carrying what they can of their personal possessions. They are of all ages. Grandchildren help their elders. Improvised shelters have been rigged up. But it’s not unique. It’s just another eviction in the Highland Clearances. Nowadays we might call it ethnic cleansing. A fire was kindled in the churchyard, round which the poor children clustered. Part of the original account reads "Two cradles with infants in them, were placed dose to the fire, and sheltered round by the dejected-looking mothers. " At the same time as these events were unfolding in Highland Scotland, you could travel speedily and safely, between Scotland’s two largest cities, Edinburgh and Glasgow, by its first inter-city railway line. It had been open for three years, as a symbol of the modern age. So what do these little cameos mean? Well, firstly that the History of Scotland goes a long way back. Secondly, that Highland and Lowland Scotland were utterly separate in language and culture for a long time. Thirdly, that Bonnie Prince Charlie should have stayed away from Scotland – full stop – and let the illustrators of shortbread tins find themselves another subject. And thirdly, it’s quite easy to connect with the history of Scotland if you use a little imagination as you visit the many historical sites. There’s more on the Jacobites on the Rob Roy page. And you can find out about the Scottish kings, especially the Stewarts. There were a lot of them – and several were very accident-prone or a bit unpopular or had English wives. Just saying…. Battle of Bannockburn - winning Scotland's independence. The Battle of Bannockburn, 1314 - a crucial event in Scotland's story. It isn't the most scenic of Scotland's battlefields but don't blame King Robert.